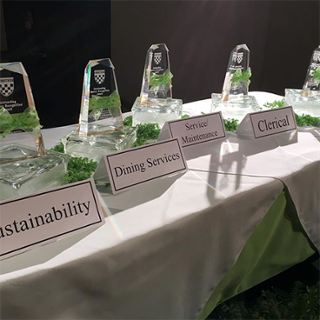 Although the Sustainability department spearheads a number of environmental initiatives, faculty and staff from around campus are “committed to reducing and reusing,” according to Rob Andrejewski, Director of Sustainability. Members of the campus community proactively find ways to turn Sustainability’s goals into a collective effort. Recently, Mei Kiu Lo, Catalog/Systems Librarian in the Law Library, reached out to Andrejewski to recycle or donate old book shelves. “In the past, these would likely have gone into the landfill dumpster. 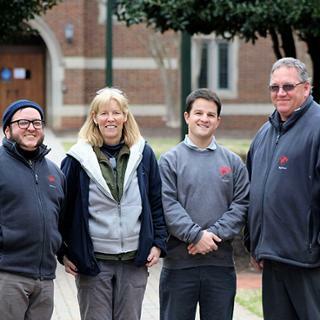 Over the past year, however, James Campbell and Scott Lincoln in Custodial and Environmental Services have developed a strong relationship with Goodwill. We now have access to a Goodwill trailer on campus to capture donations like this. This small change in standard operating procedure by Mei Kiu, James, and Scott keeps items out of the landfill, saves money on tipping [landfill] fees, deepens a community partnership, and (hopefully) provides someone else with a resource they can use,” he said. The Goodwill trailer, which moves around campus based on need, is an opportunity that came out of another Sustainability effort, the Big Yard Sale, an end-of-year collaboration between Sustainability and the Sierra Club to collect and resell items that are either donated or left behind by students. Russell Rainer, Goodwill of Virginia’s donor development manager for Central Virginia as well as a UR alumnus, helps coordinate two tractor trailers during the Big Yard Sale. Reducing food waste has also become a joint goal of Dining and Sustainability. Lou’s Café, 8:15 @ Boatwright, ETC, and Passport Café donate food to St. Stephen’s Episcopal Church on Grove Avenue. Food that is close to expiration is collected at the end of each week from locations like Lou’s that close on the weekends or before they close for breaks. “Retail Dining has been really leading the way,” Andrejewski said, mentioning that Amanda Boyd, manager at Lou’s; Eliot Cleveland, multi-unit manager at ETC; Karen Kourkoulis, manager at Passport; and Nia Williams, café manager at 8:15 are all part of the effort. Jenny Kearney, Rethink Waste & food recovery intern, coordinates dropping off food on Fridays so that community members in need can pick it up Saturday. Food donations average thirty-five pounds a week. “We have a goal of diverting 75% of waste from our waste stream. We want to reduce the overall volume as well as increase the amount that is recycled or composted,” Andrejewski commented. His team works with other departments on campus to accomplish this goal. For example, at the latest Rethink Waste football game, they partnered with Athletic department employees, including Jeff Smith, Concessions/Relief Manager; Lauren Wicklund, Associate Athletic Director; Mike O’Toole, Coordinator of Facilities & Events; and Ashley Yencho, Assistant Athletic Director, Marketing. The Rethink Waste games normally divert 35% of our waste from the landfill, but at the last game, they hit 55%. Faculty are also finding ways to incorporate sustainability into their curriculums. One of the Faculty Learning Committees, which is chaired by Mary Finley-Brook and David Salisbury, Associate Professors of Geography, Environmental Studies & International Studies, is working on plans for sustainability education at UR. There’s also an Eco-Corridor Think Tank, with faculty from a wide variety of departments and schools, who are considering various ways they could use the corridor in the curriculum. 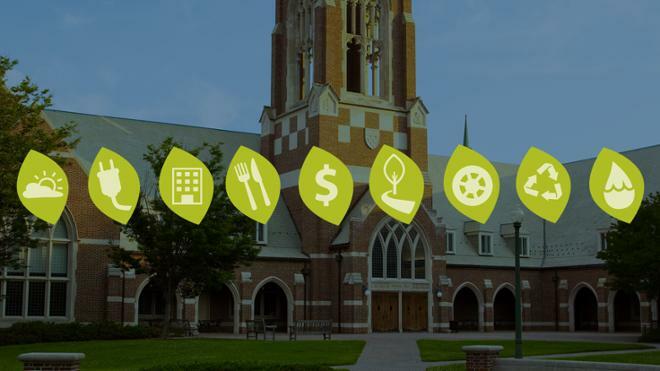 Not sure where to start contributing to sustainability on campus? Your feedback is needed!